The American College of Physicians (ACP) turned 100 years old last year. During these years, the College has been at the forefront and has acted as the conscience of American medicine. We have developed high standards for medical education and public health and have advocated for universal health insurance coverage and quality-based payment. ACP is now once again proactively addressing an issue of importance to human health. 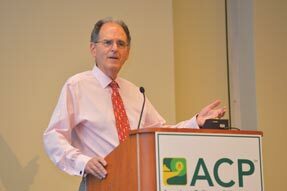 In 2014, the ACP Board of Regents approved a resolution calling for an investigation into the health effects of climate change. The result of that review , “Climate change and health: A position paper of the American College of Physicians,” was published in Annals of Internal Medicine on April 19. The United Nations Intergovernmental Panel on Climate Change (IPCC), consisting of over 2,000 of the world's leading climate scientists, has stated that the human influence on the Earth's climate is clear and that the warming of the planet is unequivocal. In the Northern Hemisphere, the period from 1983-2012 was the warmest 30-year period in the last 1,400 years and 2015 was the hottest year ever recorded on earth. Carbon dioxide concentrations are the highest in history at 400 parts per million, and greenhouse gas emissions have increased 43% in the past 6 years. The IPCC has declared that burning of fossil fuels has contributed significantly to these changes and predicts further warming of 2.6 to 4.8 degrees Celsius by the end of this century. The evidence that the climate is changing includes decreasing glacier mass and sea ice, global sea level increases, ocean warming and acidification, and more frequent episodes of extremes of weather, such as floods, drought, heat waves, hurricanes, and cyclones. The 2009 Lancet/University College London Global Health Initiative Commission called climate change “the biggest global health threat of the 21st century.” The World Health Organization (WHO) estimates climate change will cause an additional 250,000 health-related deaths per year from 2030 to 2050. Heat-related disorders. Global warming has resulted in heat waves that have caused 7,400 deaths from 1999-2010 in the United States. Europe experienced 70,000 premature deaths in a 2003 heat wave. The primary complications are muscle cramps, heat exhaustion, and stroke. Heat-related disorders can also destabilize chronic respiratory and cardiac conditions, and vulnerable populations such as the very young, the old, and the poor are particularly susceptible. Respiratory disorders. The WHO estimates that in 2012, 7 million deaths were related to indoor and outdoor air pollution. Pollen season has lengthened, and higher carbon dioxide levels lead to increased growth of allergen-producing weeds, grasses, and fungi. There are reports of increasing frequency of allergy symptoms and asthma exacerbation today. Greenhouse gas emissions trap sunlight and pollutants, leading to high ozone levels, which in turn cause decreased lung function and more visits to the emergency department in vulnerable populations. Particulate matter exposure from smoke inhalation and increased wildfires, droughts, and sandstorms has led to 339,000 premature deaths worldwide. Vector-borne and water-borne infectious disease. Rising temperatures, changing precipitation patterns, and other climate drivers could create hospitable environments for mosquitoes and ticks that carry diseases such as dengue, Lyme, chikungunya, and malaria. Floods can lead to water-borne diseases such as Vibrio infections, cholera, and typhoid. Data indicate a widening geographic distribution of these diseases in the U.S.
Food and water insecurity. Changing precipitation patterns, rising carbon dioxide and ozone levels, and higher temperatures can lead to decreased food production, decreased aquatic diversity, and decreased crop yields for corn, wheat, and rice. This can further lead to mass migrations and political and economic instability. Mental health disorders. These are related to natural disasters and include post-traumatic stress disorder, depression, isolation, and anxiety. The best illustration is Hurricane Katrina, with 56% of the affected population demonstrating increased incidences of all of the above. Despite these serious health effects, a 2015 Gallup Poll found that 66% of U.S. adults acknowledge that global warming is happening, but only 33% believe it will affect their lives. Further, a 2014 survey by the Yale Project on Climate Change Communication and the George Mason University Center for Climate Change Communication found that 61% of adults have not thought of the health effects of global climate change. 1. A global effort is needed, and the United States should take the lead on reducing greenhouse gas emissions and collaborate with countries to transition to low carbon fuels. Climate change adaptation strategies must be established, and mitigation measures must be adopted. 2. The health care sector in the U.S. and globally should take steps to implement early warning systems for severe climate events and develop resources to care for vulnerable populations. 3. The health care sector should implement environmentally sustainable and energy-efficient practices. Examples include buildings with renewable energy and use of recycled products. 4. Governments should commit to research funding to further understand, adapt, and mitigate the human health effects of global climate change. 5. Physicians individually and collectively have an opportunity to advocate for climate change adaptation and mitigation and educate the public and policymakers about the health effects of global climate change. Climate change doubters argue that the effects of climate change are projections and that they are not based on a large body of evidence. The IPCC and WHO have studied the evidence extensively, and 97% of climate scientists have concluded that climate change is real and that human activity significantly contributes to the phenomenon. Recently, the United States Global Change Research Program released a new assessment of the growing public health threat. The study reviewed more than 2,000 peer-reviewed publications of scientific data and modeling and came to the same conclusions. This report underscores the fact that addressing climate change will have not only environmental benefits but immediate health improvements as well. These include cleaner air and better respiratory health from reduced dirty fuel emissions and better cardiovascular health from active transportation like walking and cycling. As physicians who care deeply about the health of our patients and community, we have an important role to play. Physicians have the trust of the public and can help combat climate change by advocating for effective climate change adaptation and mitigation policies, by reducing greenhouse gas emissions in their own practices, and by educating their community about the potential health-related dangers posed by climate change. Practices can use energy-efficient lighting, recycle and purchase recycled products, install an electric car charging station, and avoid use of bottled water. Hospital systems can significantly impact their carbon footprint by using clean energy sources and environmentally sustainable building materials, reducing fleet emissions and food waste, and conserving water. By engaging community groups; local, state, and national legislators; and schools, colleges, and universities, physicians can raise awareness about this important issue and expand the number of voices calling for action. The College has developed an “Action Plan” that includes slides for presentation on health and global climate change, talking points for the public and policymakers, guidance on how physicians can work with colleagues to create an environmentally sustainable health sector, and patient fact sheets. This toolkit is available online . If we act now, we can create a positive story of healthy people and a healthy planet for our children and grandchildren.